NORTH Melbourne midfielder Ben Cunnington has escaped suspension for punching Melbourne's Bernie Vince in the stomach during a spiteful clash at the MCG on Sunday. Demon Christian Salem has accepted a one-match ban, however, for elbowing Kangaroos midfielder Shaun Higgins in the face in the only suspension out of round nine. 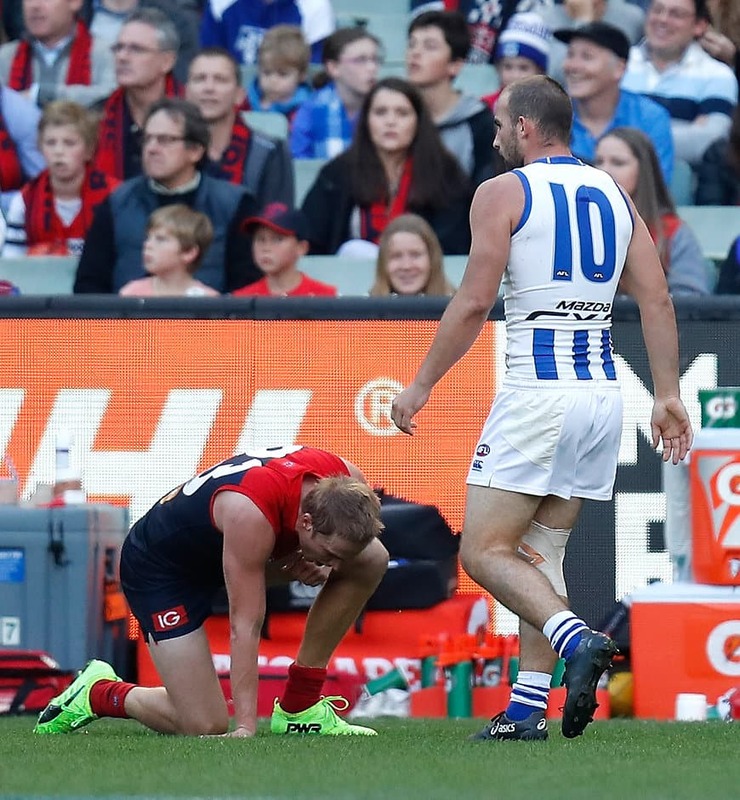 In a significant ruling from the Match Review Panel, Cunnington accepted a $1000 fine for a strike to Vince's stomach that forced his opponent from the ground and had him dry-retching on the sidelines. The MRP graded the strike as intentional conduct with low impact to the body. Intentional strikes to the body need to be graded medium impact to result in a one-match ban under the MRP's table of offences, with only two players – David Zaharakis and Levi Casboult in 2016 – breaking that threshold. AFL CEO Gillon McLachlan on Monday said he would be prepared to change the rules to stamp out intentional punches. Higgins was the third player charged out of the Kangaroos' win over the Demons, with the Panel offering the midfielder a $1000 fine for intentionally striking Clayton Oliver, which he accepted. The MRP deemed the strike was to Oliver's body, rather than his head, allowing Higgins to dodge a one-match suspension. He was not charged for a separate strike on Vince. Sydney's Kurt Tippett accepted a $1000 fine for striking St Kilda captain Jarryn Geary, with the hit graded careless conduct with low impact to the head. Essendon star Joe Daniher accepted a $1000 fine for rough conduct on Eagle Sam Mitchell, which was graded as careless conduct with low impact to the body. Carlton midfielder Patrick Cripps accepted a $1000 fine for forceful front-on contact on Fremantle's Brady Grey. The incident was graded careless conduct with low impact to the head. The MRP assessed a collision between Sydney's Callum Mills and St Kilda's Jack Newnes, but ruled Mills had no case to answer. "Both players turn to the side to brace for contact as they contest the ball. It was the view of the panel that Mills was contesting the ball and had no realistic alternative way to contest the ball," the Panel said in its findings.